Dry Rose’ has become a cause for many who take wine seriously. No, it’s definitely not White Zinfandel and pink wine is not always sweet. 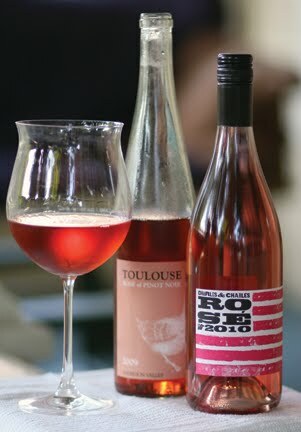 Rose’ wines are food-friendly and versatile. These pink wines are dry and a tremendous value. They are also some of the hottest wines, when it comes to sales, in the summer market. Dry, pink wine really has skyrocketed the past few years. As a matter of fact, sale of Rose’ wines priced above $8 grew more than 53 percent between 2007 and 2008. Dry Rose’ is affordable, delicious, east to pair with food and yet delightful on a summer evening with nothing but a cracker or snack foods. Most Rose’ is made from traditional red wine grapes. The wine is simply left in contact with the grape skins for less time than red wine. You get less tannin in the wine and more balanced fruit flavor. Rose’ wines have hints of strawberry and other red fruit. Rose’ can also be made from just about any red wine grape. Rose’ is my summer guilty pleasure. Here are the four best Rose’ wines I’ve found this summer. All of these are widely available. Mas Donis 2010 Rosat – Spanish winemakers know how to make great Rose’. This inexpensive Rose is 80 percent Grenache, 10 percent Syrah and 10 percent Merlot. It is a full-bodied wine that will give you hints of red fruit, smoky flavors, and nice acidity. The Mas Donis stands out for its beautiful nose. Some Rose’ can be pretty flat when you stick your nose in the glass. You’ll love the wave of strawberry you get when you take a whiff of this $8-$12 wine. Andieux & Fils Cotes de Provence – French Rose’ is every bit as finessed and delicate as you would expect. The A&F Rose’ is refreshing and lighter than the Rosat. The blend is 60 percent Grenache and 40 percent Syrah. It has a salmon color with beautiful hints of red raspberry, strawberry, and even a hint of apricot or maybe peach on your palate. Like most Rose’, this wine has low alcohol at just 12.5 percent. Banfi Rosa Regale – And if you really want to try something different pick up this delicious sparkler. Banfi is one of the most recognized wine names in Italy. They make this beautiful sparkling Rose’ that would be a marvelous before or after-dinner delight. Strong raspberry is lush on the mid palate. The bubbles are really quite restrained. The dark red cranberry color is beautiful. The alcohol is a ridiculously low 7 percent. This is the most expensive wine on the list at $20. Charles & Charles 2010 Rose – Rose from Spain, France and Italy, and of course now one from the U.S.A. Charles Smith, of the two Charlies in the name, is one of Washington state’s best known, controversial, out-spoken and talented winemakers. This Rose’ is 100 percent Syrah and it rocks. It’s the best I’ve tasted this summer and maybe one of the best I’ve ever had. It is big in flavor – think sage, raspberry, and maybe even a Jolly Rancher. This wine is proof you can enjoy world class wine for $10-$13. Finally, I’d also suggest seeking out Pinot Noir Rose for Pinot loves. Most Pinot Rose’ is going to be above the price points mentioned here but the well-made Pinot Rose’ is a palate-pleasing treat.